The Newtown Jets registered their biggest home-game winning margin in eight years when they defeated Wentworthville 54-6 at Henson Park last Saturday. This home-game occasion was also notable for the Latin American Rugby League extravaganza held earlier on the day, with six different Central American and South American nations on show. Old Henson Park, now in its 80th year as a Rugby League ground, has never known such a dramatic influx of Hispanic flamboyance. Jets supporters might have admitted to some trepidation prior to their team’s game against the Parramatta Eels feeder club last Saturday. Newtown was coming off a three-week enforced layoff, having had a scheduled bye followed by a postponed fixture due to wet weather. The Jets took the initiative early against the Wenty Magpies, scoring a converted try in the second minute and then adding four more to go in at the half-time break with a 26-0 lead. The Newtown team was clearly on a mission and never let Wentworthville back into the contest in the second half. Left-side centre Jordan Drew and winger Travis Robinson each scored three tries, while backrower Kurt Capewell, fullback and captain Mitch Brown, halfback Fa’amanu (Nu) Brown and five-eighth Jaline Graham were also among the try-scorers. Nu Brown converted seven of the tries, with several of his successful goal-kicks being from out wide. Wenty scored a converted try in the last minute of play, with Newtown’s 54-6 win being their biggest winning margin at Henson Park since 2008. Head coach Greg Matterson and his staff were naturally satisfied with the team’s overall performance, but conceded that their opponents weren’t anywhere near full strength. Matterson made mention of the strong form shown by two of the squad’s youngest members, big forwards Harrison Muller and Kenny Niko (who was on debut with the Jets). Newtown has maintained a relatively stable squad thus far in the ISP NSW competition, and depth in playing strength is going to be a crucial factor in the team’s performance in the second half of the competition. Newtown’s back three in Mitch Brown and wingers Travis Robinson and Jacob Gagan all played strongly, while former Brisbane Bronco Jordan Drew was once again a real handful for the opposition. Nu Brown showcased his extensive set of skills, and forwards Kurt Kara, Jason Schirnack, Malakai Houma and Matt McIlwrick were all prominent on a day when the Newtown pack dominated their opponents. In the curtain-raiser internationals, Ecuador defeated Colombia in a Sevens match, Uruguay outpointed Peru in the Nines, while Chile beat El Salvador 58-20 in what was the inaugural full-scale Latin American Rugby League international. 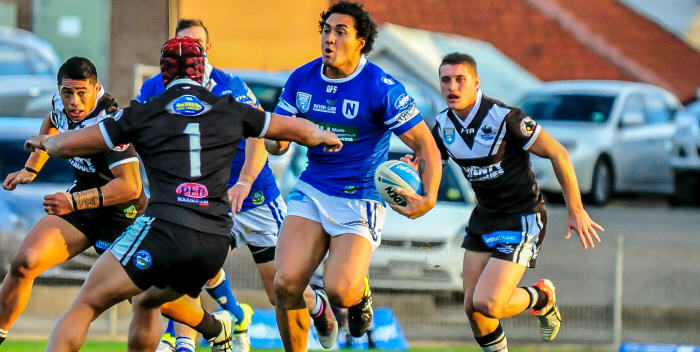 The Newtown Jets are now in third place on the ISP NSW competition table, and they are going into one of this season’s marquee occasions when they meet the current competition leaders, the New Zealand Warriors, at Henson Park this Saturday, 18th June at 3.00pm. The Warriors, under the coaching of Kiwi Rugby League legend Stacey Jones, are coming off seven successive wins. The New Zealanders defeated Newtown 20-18 when the teams met back in Round Three at Mt Smart Stadium.